SoapStandle, LLC today launched its namesake product SoapStandle®, a simple device that attaches to any bar of soap to prevent goo and provide a no-slip grip, at Building 3, Booth #2617 in the AmericasMart during the International Gift and Home Furnishings Market January 9 to 16 in Atlanta. Goo forms when bar soap stays wet. The portion that doesn't dry turns to goo which is slimy, gets on everything, and is hard to wipe off your hand, counter, shower/bath ledge or soap dish. SoapStandle’s patented design easily attaches to any bar of soap and allows the bar to 'shed' water and dry, so the goo never develops. Keeping bar soap dry significantly reduces soap waste giving an average of 30% more uses from each bar. Avoiding the goo is important beyond that it’s messy – when goo develops soap deteriorates faster, and instead of cleaning it goes down the drain. “Avoiding soap goo is the single biggest reason people give for buying liquid soap for home use. If goo is eliminated, bar soap becomes viable for many people which can improve both personal health and the larger world,” said Jimmy Gould, founder of SoapStandle. “If you like using higher-end bar soap, you’ll enjoy the SoapStandle even more. While it works with any bar of soap, the fact that it can extend the life of an expensive bar by 30%, then the value is even more compelling. Finally, liquid soap is an environmental train wreck with its plastic packaging and this simple, little device can have a huge impact every time you visit the sink, shower or bath,” added Gould. 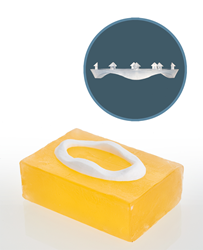 Made of recyclable acrylic, the SoapStandle is easy to use. Press the teeth firmly into the soap bar to take advantage of the product's ergonomically designed oval shape and grooved surface to both grip as well as rest the bar when not in use. After use, wherever the bar with the affixed SoapStandle is placed, air will circulate so goo will not develop on the bar. To visually see the SoapStandle advantage, watch this time-lapse video comparison of a SoapStandle-equipped bar of soap versus a “naked” bar sitting atop a soap dish, a counter top and soap saver pad after an equal number of 15 second hand washings. The SoapStandle is priced two per package with an MSRP of US$7.50. Volume discounts are available. Please contact info(at)soapstandle(dot)com or call 901-218-9753 for more information. The SoapStandle is a small simple device that affixes to a bar of soap via small points that go into one side of the bar, creating a platform on which the soap is elevated. Since air can circulate 360° around the soap when it’s not being used, it dries, thus inhibiting the goo that normally accumulates when you set a bar down. Visit http://www.soapstandle.com.